The men and women novices boxing meet conducted by the Amateur Boxing Association of Sri Lanka (ABA) is scheduled to be held from April 24 to 28 at the Sugathadasa Indoor Stadium. 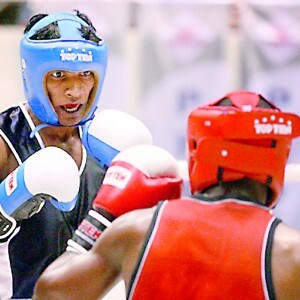 The five day contest will see a host of pugilists from Army, Air Force, Navy, Police, Slimline, Unichela BC, Linea, Thrulie, MAS Southern, Silueta, Army Red, Kotalawela Defence Academy, Casualine and Vidyartha contesting for the titles. ABA Spokesman stated that due to increasing demand the organizers have planned to conduct the meet over five days with the aim of accommodating all the entries that have been received. All the events that will be held in the ten weights of both the men’s and women’s categories will be conducted according to the 2013 rules set by the governing body AIBA. The meet is open to boxers between the age groups from 19 to 40 who have never won a novice, intermediate or other recognized boxing titles. The winner and runner up of each weight category will be eligible to participate in open meets such as the Layton Cup, Clifford Cup and the National Championship. Last year in the men’s category Army dominated the proceedings winning four weight classes followed by Slimline (2) and Army Red along with Navy and Air Force winning one each while in the women’s category Thurulie BC won two with MAS Southern, Linea, Army and Navy winning one each. Men: 49kg Light Flyweight, 52kg Flyweight, 56kg Bantamweight, 60kg Lightweight, 64kg Light Welterweight, 69kg Welterweight, 75kg Middleweight, 81kg Light Heavyweight, 91kg Heavyweight, Over 90kg Super Heavyweight.